Bliss Core Vinyl Flooring is a vinyl flooring that emulates the installation and thickness of laminate floors. 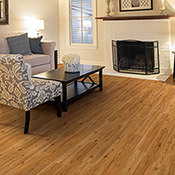 Core Vinyl Flooring is very easy to install and can even be used on imperfect subfloors. Bliss Core Vinyl Floors are also 100% waterproof and are perfect for high traffic homes and light traffic businesses. Bliss Core is the latest introduction in the vinyl market, offering features and benefits unique to its patent-pending, rigid core construction. It offers the durability, sustainability and style that is unmatched in other flooring categories. Bliss Core offers 12 exclusive colors and visuals that are traditional, trendy and everything in-between. Bliss Core floors are Greenguard Gold certified for infoor air quality, offering complete peace of mind when it comes to a fresh and healthy environment.